One of the strategies we're asked to review is shopping cart abandonment. In the past two weeks, I noticed a number of trade journals, bloggers, and consultants promoting shopping cart improvement strategies. There's no doubt that the shopping experience can be improved ... we all agree with that. But shopping cart abandonment is an inherently flawed metric, a metric that does not do a good job of measuring longitudinal customer behavior. In the six months after shopping cart abandonment improved, did the number of new customers increase at a rate faster than planned? In the six months after shopping cart abandonment improved, did the number of reactivated customers increase at a rate faster than planned? In the six months after shopping cart abandonment improved, did the retention rate of your twelve month buyer file improve? In the six months after shopping cart abandonment improved, did the orders per retained customer improve? If the answer to these four questions is "no", and yet your shopping cart abandonment metric improved, then you did not fundamentally change customer behavior. Ask the consultant you are working with to verify that these four metrics were improved when the consultant worked on prior shopping cart abandonment projects. Good consultants can provide you with this data, or if they are under NDA, they can at least verify the magnitude of improvement in customer metrics. Note to the trade journals, vendors, bloggers, commenters, subscribers, and practitioners who are engaged in e-mail civil war this week. Maybe it is time to stop labeling many of us marketers as being "stupid". Maybe it is time to stop labeling vendors/bloggers as "stupid". Maybe it is time to consider not throwing trade journalists under the bus for unverified trade journal business strategies without verifying facts first. Maybe it is time to better understand all company practices ahead of time so that vendors/bloggers aren't throwing folks under the bus.. These discussions are good for trade journal and blog readership, and result in a lot of comments on a blog ... an "engaged" social media audience, if you will. These discussions do not make my clients one penny of profit. In our current economic climate, clients seem very interested in increasing sales and profits. Let's try to focus on helping people use e-mail marketing to increase sales and profit. We can constructively point out strategic opportunities without malice. The e-mail channel is being chewed-up by RSS and Social Media. We don't need the e-mail community cannibalizing itself. We need the e-mail community to generate sales and profit, to make customers happy, to voluntarily help clients, to point out fewer faults. Twitter And Multichannel Forensics And Nielsen! This article absolutely warms my heart ... a great way to analyze Twitter using Multichannel Forensics. LOVE IT! David Martin at Nielsen uses the 40% level (Acquisition Mode) to make a point. LOVE IT! A sampling of some of the multichannel solutions offered by companies in The Catalog Success 200. Jann's Netcraft offers an "Ask The Experts" section ... anybody want to learn more about weedless jigs? Park Seed Company has digital online catalogs that you can browse through. DharmaCrafts gives the readers a chance to read "love letters" from customers. Audio Editions will soon offer a new version of their website, with customer reviews. Raintree Nursery allows you to see the impact of climate change over the past century. Ginny's Catalog has a forum where you can share your cooking and kitchen ideas. Brisky Pet Products cares about starving prairie dogs. Crazy Shirts has a freelance artist program ... get paid!! Dakin Farm has recipies for Keilbasa. Christian Tools of Affirmation has a social media presence that exceeds the efforts of most catalogers. Speak Spanish? Auto Mart Toolmart has you covered with a Spanish language site. The Atlanta Cutlery Corp. experiments with video marketing. Back To Basics Toys offers readers articles from Scholastic Inc.
TherAdapt Products provide several medical letters to assist with product purchases. MindWare categorizes award winning games for you to browse. Paul Fredrick MenStyle has a box on the homepage if you heard about their brand on a television commercial --- allowing you to enter the password from the commercial. Nice tracking tool! Valley Vet Supply lets you sign up for RSS from the homepage --- the icon is boldly featured above the fold. Done with your FLOR product --- recycle it!! SeaBear hosts once-per-year culinary events --- register now! Would you like to author content that spreads like a virus? It's not that difficult, folks! Just follow these three easy steps to instant viral marketing success! Write great content. Nobody wants to read something boring and dry. Use a catchy subject line, like "Five easy steps" or "Four easy steps" or "Three easy steps". Build a loyal following, one that is willing to share your content on micro-blogging sites like Twitter. Have you ever noticed that this type of content is rampant in the marketing world? Ever wonder why? I recently tested different writing styles. For instance, this article on Multichannel Cannibalization offered fairly useful insights. Nobody linked to the article. This article (49 Vital Multichannel Modeling Tips) spread like a rampant, unchecked virus. The content, while absolutely useful, was disorganized and lacked depth or true explanation --- it was a bullet-point filled, connect-the-dots and color-within-the-lines style of writing. A consultant told me two years ago that "... stop trying to make your readers think, just tell the audience what you want them to do". Why do you think we respond to the canned, checklist style of writing so much more frequently than we respond to thoughtful essays? Is it true that we marketers don't want to think, that we simply prefer to be told what to do? Are you coming to my session at ACCM? If you are, and you want to include your data in the Zip Code Forensics database, bring a year's worth of data (one row per zip code, each column represents total annual sales in that zip code by channel), and I'll be sure to include your data in the database. Please contact me for additional details. For those of you who are scheduling time with me to talk about your Multichannel Forensics for Catalog Marketers projects, review the slide presentation below. This explains what a typical Multichannel Forensics project for Catalog Marketers is, and illustrates the cost of a project. The projects are great for reducing catalog expense while minimizing demand loss. Let me know if you want to schedule time to meet at ACCM 2009. View more presentations from MineThatData. Kevin Hillstrom, Jim Novo, and Akin Arikan. Oh My! Is there a better way to spend an hour at work than listening to three multichannel marketing folks talking about online and offline marketing? Here is your opportunity to participate in a session hosted by the Web Analytics Association titled "What Online Marketers Can Teach Their Offline Colleagues (and vice versa). On Tuesday, May 19, the venerable Jim Novo, multichannel marketing guru Akin Arikan, and the Godfather of Multichannel Forensics (that's me) get together to share our thoughts on online and offline marketing strategies and measurement. Web Analytics Association events are exceptionally well attended. Given the quality of speakers and the reputation of the Web Analytics Association, this is (IMHO as the Twitterati say) a can't miss hour of knowledge exchange. So why not join us on Tuesday, May 19, at 12:00pm EDT / 9:00am PDT? Register here!! This week, I read a blog post where an e-mail marketing proponent was relaying a Twitter conversation with others on the blog, in chronological order. One might think that the e-mail community might use e-mail for communication instead of Twitter, if e-mail is as valuable as we're told. Today, I visited the homepage of a very popular e-mail marketing service. On the homepage alone, there are four references to blog posts, one to subscribe to a podcast, one to download a white paper, one to a message board, one to press releases, one to "resources", two opportunities to subscribe to content via RSS, and one to subscribe via e-mail. Wouldn't it make sense for the e-mail marketing vendor to create a double-opt-in, permission-based list of eager B2B subscribers who love to learn about e-mail marketing? Why defer to RSS? E-Mail marketing is at a major inflection point. The micro-channel is being seriously cannibalized by social media. Seriously cannibalized. Conversations have moved from e-mail to Twitter and Facebook. And when conversations move, marketers follow. E-Mail vendors might blame e-mail marketers for any perceived failures in e-mail marketing. And that's probably a fair assessment. Here is every subject line from every e-mail marketing message I received from one brand in just the past twenty-three days. Free Shipping And $10 Off. $10 Off And Free Shipping. Today Only, 25% Off And Free Shipping. 20% Off Sitewide, One Day Only. Free Shipping, One More Day. First Time Ever, Save 30%. 30% Off, Three Days Left. 6 Hours Left, 30% Off. Honestly, there's nothing wrong with that strategy, especially if your target customer is a discount/promo loving brand advocate who signed up for a daily promo-based message. But we are at a serious inflection point. E-mail is going to be one of a very small number of ways that a marketer can push a permission-based message to a customer ... so for marketers, this is an incredibly valuable tool. It just seems like something is going to change, and our industry is going to need some leadership to navigate the discount/promo side of e-mail marketing and the serious cannibalization that is happening due to social media. I wish I had the answers, I don't. All I know is that my Multichannel Forensics work indicates that e-mail marketing has significant value as a bridge between older channels and emerging channels, so I care about the craft of e-mail marketing. Are You On The Wrong Side Of Technology? I've been there. Nordstrom, 2004. Higher-end retailers were the first to witness the death of the 1980s catalog business model. Outside lists stopped performing long before the collapse most catalogers are experiencing today. Customers raced online, then stayed online, then stopped using the catalog for shopping inspiration. Mail/Holdout tests proved this ... matchback analytics that were promoted by the vendor community were much less accurate. At some point, the economics of catalog marketing stop making sense to somebody who is good with numbers, a high-level person in the finance department, for instance. This is a bad day, if your entire career was based on the catalog business model, like, say, my career was. You're stuck defending a dying business model, while all around you bad ideas circulate, ideas that will make your company less money than the catalog marketing they deride. One executive said that e-mail marketing will replace catalog marketing just fine --- he never looks at catalogs, and would welcome a highly targeted e-mail message. The whole room agrees ... then it's your job to remind the room that e-mail marketing generates $0.18 per e-mail, while catalog marketing generates $4.50 per catalog ...and oh, by the way, half of the customer file hates e-mail marketing and refuses to participate. The room gets quiet for a moment, but then the ideas keep on coming. What if we stopped renting names and let the customer determine how many catalogs to receive? What if we only mailed catalogs to store customers? What if we only put the most most fashionable merchandise in catalogs and stopped focusing on what actually sells? What if we just killed the catalog altogether? That becomes the inevitable conclusion, because any other idea is just a poor, sub-optimal compromise. You're told that you will wind down the catalog program over the next year. You get to eliminate a third of the jobs in your department. You get to watch your favorite co-workers leave for other departments, sticking their tongue out at you as they head out the door. Worse, however, is the fact that most of your favorite catalog employees flee the company, looking for their next challenge. So you do the hard work. You downsize, you re-structure most of the jobs so that your employees will thrive in a digital future. Nobody thanks you for this job. It took about thirty months to make this transition, and by the time the transition was complete, my job as I knew it was over. A new regime took over, and I didn't have much else left to do. Time to move on. You feel like a dweeby boy at the High School prom, one who had this wonderful girlfriend, only to have the girlfriend find somebody in a nicer tuxedo. They race off to an after-prom party while you remind everybody that you were responsible for bringing her to the prom in the first place. In my case, I got a wonderful head-start on my consulting career, because Don Libey was willing to publish two of my books before Nordstrom went in a different direction. I had a one year head-start on my blog before leaving Nordstrom. The combined efforts of the books and blog positioned me for a post-catalog world. I entered this post-catalog world with a lot of good experience, only to find that almost nobody wanted to listen. The very catalog community that could benefit from my experience largely shunned what I learned, occasionally with a condescending attitude. You walk this fine line between desperately wanting to help your industry and wanting to scold your industry for not "listening". As we all know, five mega-trends or events ended 1980s-style catalog marketing. Our industry only likes to acknowledge the first two events. The great postage increase of 2007. The great implosion of 2008 (i.e. the "financial crisis"). The aging of the baby boomer generation, a cohort being replaced by younger individuals who do not shop the way baby boomers shop. The power of search to re-direct demand generated by offline efforts to those who play by Google's rules the best. Do-Not-Call and CAN-SPAM legislation, which gave customers the power to say NO, which ultimately resulted in the amazing declines in customer acquisition productivity catalogers are experiencing. And it isn't fun to realize you need help. Your business model may still be profitable, while all around you, the sharks swim, blasting your Luddite-style of marketing with 140 sharp teeth called "Twitter". Never mind their business model doesn't work either, they're the new experts, the anointed ones. They praise Dell, a sixty-billion dollar brand, for generating a measly million dollars using their technology --- they mock you without offering a credible transition plan. And they'll be gone in two years when Twitter isn't fashionable, lauding the next shiny new toy. Websites, E-mail, Geocities, MySpace, Blogs, Facebook, Twitter ... it never ends, with each new tool seemingly attracting a smaller audience. If this keeps up, we truly will be executing 1-to-1 marketing. These days, the collapse of the newspaper industry is all around us. You can't help but feel bad for the journalist who loves her job, only to have a business model implode. How will she make a living? The music industry isn't much different --- with the imminent death of the compact disk causing a complete restructuring of the way music is made and sold. What do you do if you worked in an independent record store for the past fifteen years, how will you make a living? The catalog industry is different, in that e-commerce forms a bridge between the catalog marketing of the 1980s and the hologram marketing that is coming. Still, the traditional business model of buying and selling lists, of planning a merchandise assortment 124 pages at a time, fifteen times a year, nine months before the catalog drops, is going away. And as it goes away, an entire generation of marketers, highly passionate about what we've always done, are on the wrong side of technology. For us, the future is really quite bright! See, we have to make a decision. Do we love putting catalogs together, or do we love selling merchandise? We have to choose. If we love putting catalogs together, we can still do that. There will be many companies that, for the next fifteen years, will cater to the rural baby boomer audience. For the traditional catalog marketer, this will be a nice capstone on a wonderful career. If we love selling merchandise, there's never been a better time to sell merchandise! There are a nearly infinite number of micro-channels that allow the merchant to have a relationship with the customer. What a wonderful time to be a merchant, to learn! Me? I've already made the hard transition. It took five year to go from spending every ounce of energy trying to defend a dying business model to downsizing a department to saying goodbye to my friends to the end of my job at Nordstrom to starting a consulting practice and being laughed at by some in my industry to finally having a thriving consulting practice. Multichannel Forensics is channel agnostic --- the methodology will explain whatever comes to us in the future. My goal is to never be on the wrong side of technology again. Of course, I already am on the wrong side of technology, being one of the few remaning long-form bloggers in a world dominated by 140 character tweets about people spitting on pizzas at Dominos. But the goal remains ... to keep up with technology. Here are 49 Multichannel Modeling Tips, for those of you who know how to interpret a "Wald" Statistic. Tip #1: More business insight can be gained by modeling response over the course of a year than can be gained by modeling response for a campaign. Tip #2: If you are modeling more than 100,000 customers, t-statistics are useless in Ordinary Least Squares Regression. You'll probably need a t-score of 10 or 25 to detect true significance. And at 1,000,000 customers, this measure increases to 50 or 100. Tip #3: For many businesses, seasonality matters. Create variables to detect seasonality. Tip #4: Recency usually isn't a linear relationship. Often, the square root transformation works well for recency. Tip #5: If you are modeling just the twelve month file, try using dummy variables for each month of recency. This allows you to detect the right transformation to use if recency is a continuous variable, and can help you detect seasonality. Tip #6: Dummy variables are beautiful! Tip #7: Parsimony matters. A model that has four variables is usually better than a model that has four-hundred variables. Tip #8: Models with four variables are boring. Build your model with four-hundred variables, so that you can gain as much business insight as possible. Then implement the model with four variables. Tip #9: Decide whether you will specialize in business insight, or mathematical brilliance. Don't focus on both. Your career path depends upon which path you choose. Tip #10: Business leaders are yearning for business insight, the kind gleaned from statistical models. Tip #11: Business leaders hate geeky math ... unless, of course, the business leader is a lover of geeky math. Tip #12: In multichannel modeling, recency, frequency, and monetary information capture the vast majority of variability. Tip #13: If frequency and monetary value are highly correlated, use frequency in your Logistic Regression models, and use average order value in your Ordinary Least Squares spending models. Tip #14: Some people are able to get away with violating about 22,483 assumptions, combining response and spend models into one model analyzed with Ordinary Least Squares regression. Tip #15: Residual analysis across 295,483 customers is a challenge! Summarize across individual values in your variables, and then conduct your residual analysis. Tip #16: Enter into a drawing for a free copy of my "Hillstrom's Database Marketing" book if you know how to apply the "Durbin-Watson" statistic to multichannel modeling issues. 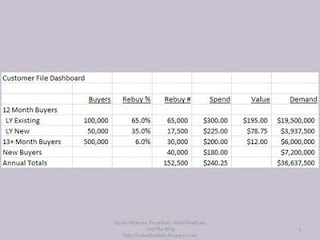 Tip #17: Annual response/spend models should be created for each important channel you analyze. Tip #18: Consider a dummy variable for each micro-channel you analyze. Tip #19: Use separate dummy variables for each important combination of paid search engine (Google, Yahoo!, MSN), branded/non-branded, and any important keywords. There is a richness of business intelligence to be understood from these variables! Tip #20: If you have an Amazon store, be sure to have a dummy variable that captures the impact of Amazon purchases on your business. 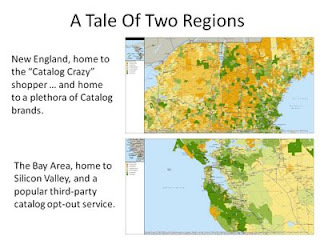 Tip #21: Consider using dummy variables that capture the impact of geography on your business --- urban, suburban, and rural variables do make a difference. Tip #22: If your business generates sales from stores, use dummy variables to capture the impact of being 0-4, 5-9, 11-25, 26-50, and 51+ miles from a store. Tip #23: Consider building completely different models for estimating who will purchase during the holiday shopping season. Tip #24: Web Analytics click data ages QUICKLY. Catalog purchase data ages SLOWLY. Be sure to capture the impact of each dynamic in your models. Tip #25: Model the recency of clicks in your e-mail campaigns. But remember, e-mail campaign purchases are much more important than e-mail campaign clicks. Tip #26: Include dummy variables that record the "source of acquisition" for each customer. Customers acquired from many sources have minimal future value. Tip #27: Include dummy variables that record "when" customers were acquired. A customer acquired twenty years ago spending $100 in 2008 is worth more than a customer acquired in 2006, spending $100 in 2008. Tip #28: If you are a Web Analyst, seriously consider making the transition to statistical analysis. Tip #29: More variables matter when predicting response than when predicting spend. Often, spend can be well predicted by frequency and average order value. Tip #30: Throw out many of the traditional "rules" that statisticians require when modeling hundreds of thousands or millions of customers. Modeling customer behavior is more of an art than a science. Tip #31: Get yourself a REALLY FAST rocket-ship of a computer! At one company, I literally offered to buy my own hardware, when the finance department refused my capital request for new equipment. One month later, I resigned. Tip #32: Use software that you are comfortable with. That might be "R", SPSS, SAS, Statistica, Excel/SQL, whatever, use what you like to use. Tip #33: If the business conditions that existed when you built your model no longer exist, BE CAREFUL! Tip #34: When working with different micro-channels (Twitter, Facebook), use age-based dummy variables if possible. In other words, create dummy variables for 18-29 year olds, 30-39 year olds, you get the picture. Go ahead and use any age range you wish. Tip #35: Very interesting findings await the multichannel statistician who runs a Factor Analysis. Tip #36: Business leaders intuitively know what an "A" customer is, compared with a "B", "C", "D" or "F" customer. So instead of reporting on different predictions, simply grade your customers, and speak to business leaders in terms of grades. Tip #37: If you are analyzing categorical data, give Correspondence Analysis a try --- one of my personal favorites! Tip #38: Never run a Neural Network model and then try to explain the results to a person who does not know how to run models but thinks s/he knows how to interpret regression models. Tip #39: Use dummy variables for each store your business generates sales from. Tip #40: Interaction terms MATTER! This is where you learn that "Multichannel Customers Are Not Always The Best Customers"! Tip #41: Create dummy variables that evaluate every employee who answers customer questions via Live Chat. Do the same thing for Telephone Reps, and Store Employees. You'll learn who your most valuable employees are! Tip #42: Create dummy variables for the blogs responsible for sending you the most traffic. Tip #43: MERCHANDISE MATTERS! Include variables that feature the merchandise divisions or departments that customers purchase from. Tip #44: Actively model future return rates, and then stop marketing to customers who are predicted to return too much merchandise. Tip #45: A customer who purchased five $50 items behaves different from customers who purchase one $250 item. Tip #46: The best projects are projects you initiate. Always do what management asks you to do. But keep Friday afternoons free, if you can, to run your own models, to investigate your own ideas. Tip #47: Never quit. Do not listen to folks who mock you, who call you a "geek", who demean your math in favor of their gut opinions. Tip #48: Always have a validation sample to validate your results against. In other words, build your model against half of the data (or 70% or whatever you think is the right percentage), and then rank-order the holdout sample to make sure you did a good job. Tip #49: Some of the best models are built against mail / holdout groups. In other words, you build a model for folks mailed an e-mail or catalog --- and you build a model for folks held out (an equally random sample of customers). Subtract the predicted values of the mailed and holdout models for the "inbcremental" value of your campaign. But be careful! This style of analysis is subject to big problems if the models have unstable or non-linear coefficients. In a recent investor conference call, Talbots management spoke of "aligning their channels". Channel alignment is one of the most challenging aspects of being a multichannel marketer in the year 2009. In 2001, the concept was easy. The dot.com crowd had just flushed billions of dollars in the hope of monetizing eyeballs. Traditional direct marketers were looking to take control over marketing, doing so by astroturfing the concept of "multichannel", the concept that if we simply align all of our channels, customers will be satisfied. Research organizations surveyed customers, customers told the research organizations what they wanted to hear, brands purchased research organization reports and heard what they wanted to hear, and then pursued the "multichannel route" under the mantra that "Multichannel Customers are the Best Customers". By and large, the multichannel playbook consisted of the following strategies. Offer the same merchandise in every channel --- stores, online, catalogs. Offer the same merchandise at the same price in every channel. Offer promotions that can be redeemed across all channels. Promote all products via all channels --- catalogs, e-mail, etc. Make the website a resource for cross-channel research. Match your online orders back to traditional marketing activities, to prove that traditional marketing activities were responsible for online orders. All of this sounded good, in theory. Eight years later, we're left with so few success stories. From time to time, we'll hear of a standalone marketing campaign that delivered a 2,493% increase in ROI. But we seldom hear of a brand that "connected the dots" and "reaped the benefits" that we were astroturfed into believing. If you disagree, pick the brand that did this well, and outline in the comments section the financials that demonstrate that the multichannel industry script worked. I recall my CEO at Eddie Bauer, the venerable Rick Fersch, asking me a unique question back in 1999. Our website skewed toward a male demographic, our catalog skewed toward a female demographic. He asked me "Why would we want to use a catalog to drive sales online if the catalog customer is female, and the online buyer is male?" Of course, one might use the catalog to drive female shoppers online to buy womens merchandise, but that wasn't quite how our business worked back in 1999. Instead, Mr. Fersch was asking a rational question --- "Should these channels be aligned?" I dare you to find industry experts who publicly ask this question. But this question is fundamental to understanding marketing in 2009. For instance, say your "traditional" marketing department dreams up a promotion --- 25% off of your order if you spend $200 or more. Should this promotion appear in your catalog? Should this promotion be offered in e-mail marketing? Should this promotion be broadcast on Twitter? Should this promotion be part of your search marketing strategy? Should this promotion be part of a blogger outreach program? Should this promotion be part of a direct mail campaign? Should this promotion be offered on the e-commerce homepage? Should this promotion be part of our radio, newspaper, and magazine ads? Traditional multichannel marketing suggests the answer to all questions is YES! Modern channel alignment suggests we might want to explore the audience that participates in each micro-channel. Each micro-channel attracts a different audience, with different demographics, psychographics, needs and expectations. Why not consider leveraging the strengths of each micro-channel? The "Adjusted Index" helps the business leader who manages an "emerging channel", like Twitter for instance, to understand the future role an emerging channel is likely to play. 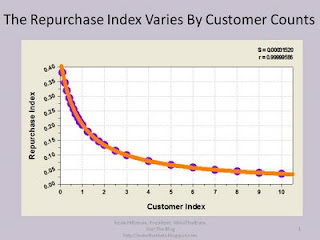 Here's the deal --- when customer counts are small, in relation to the dominant channel, it is very difficult for the emerging channel to do anything but appear to "feed" the dominant channel, while the dominant channel doesn't appear to do anything but stay in "isolation", hoarding customers from the emerging channel. Time takes care of this problem. But we want to be able to see what role each channel might play in the future. So give this a try. The formula was created from the composite of the majority of Multichannel Forensics projects I've worked on. Step 1: Calculate "Indexed Customers" --- Existing Channel customers divided by Emerging Channel customers. In yesterday's example, this is 25,000 / 500 = 50. Step 2: Record your repurchase index. In yesterday's example, the index for Online customers migrating to Twitter is 4%. Step 3: Calculate "X", from the following formula: 1 / (2.55 * (Indexed Customers) + 2.36). In this case, "X" is equal to 0.0077. Step 4: Calculate the "Adjusted Index": Adjusted Index = (Repurchase Index / X). In this case, the Adjusted Index = (0.04 / 0.0077) = 5.19. If this index is greater than 1.00, then it is likely that the Existing Channel is going to fuel the growth of the Emerging Channel. If the index is less than 1.00, then it is unlikely that the Existing Channel is going to fuel the growth of the Emerging Channel. In this example, the Online Channel is likely to fuel the growth of Twitter, with customers eventually leaving the Online Channel for Twitter. Your mileage may vary. Step 1: Calculate "Indexed Customers" --- Emerging Channel customers divided by Existing Channel customers. In yesterday's example, this is 500 / 25,000 = 0.02. Step 2: Record your repurchase index. In yesterday's example, the index for Twitter customers migrating to the Online Channel is 80%. Step 3: Calculate "X", from the following formula: 1 / (2.55 * (Indexed Customers) + 2.36). In this case, "X" is equal to 0.415. In this example, Twitter and E-Commerce are likely to evolve toward a synergistic relationship, where customers willingly switch back and forth between each channel. This methodology allows you to understand the trends that are likely to emerge in the future, and gives the proponents of emerging channels an opportunity to be excited about the future trajectory of the emerging channel. And with the explosion of social media channels that appear to have almost no impact on sales, we need this index to help us understand what the long-term potential might be. Companies that analyze longitudinal website behavior know that a purchase happens after a series of website visits. For many, a website purchase happens after, say, four visits. But that's not how we measure things, is it? We try our hardest to allocate orders to the advertising vehicle that caused the order, seldom considering a series of events. For instance, take paid search as an example. Assume that a paid search campaign results in a 3% conversion rate and a $100 AOV. We run a profit and loss statement on the 0.03 * 100 = $3.00 demand generated by the campaign, factoring in the cost of the campaign. But what about the 97% of visitors who did not purchase? What if you had this data? Of those who are left, 50% will visit the website again within one week, with 3% converting, spending $100 each. Of those who are left, 50% will not visit again. Those who are left will visit again within three weeks, with 3% converting, spending $100 each. Of those who are left, 50% will not visit again. Those who are left will visit again within one month, with 3% converting, spending $100 each. Of those who are left, 50% will not visit again. Those who are left will visit again within four months, with 3% converting, spending $100 each. Of those who are left, 50% will not visit again. Those who are left will visit again within six months, with 3% converting, spending $100 each. There is value in each case, value that most of us choose not to measure. When I iterate through the five cases above, I calculate an additional $2.75 of future visitor value. In other words, we measure the $3.00 generated by short-term conversion. We don't always measure the $2.75 of future conversions. Now there may be additional expenses associated with the $2.75 number --- that customer might require additional paid search expense or might use a shopping comparison site, whatever. So we need to run a true profit and loss statement on the additional $2.75 generated by future visits. If each first-time visitor (one that doesn't convert immediately) is worth $0.30 profit over the next twelve months, you think differently about attracting visitors, don't you? Now you're ready to experiment, like the folks at Drugstore.com and Zappos recently experimented. Very interesting comments from leadership. Look, we’re doing some very innovative things that frankly aren’t a huge investment but creates some great buzz. So obviously we are thrilled that Michelle Obama engaged in the brand. We ran a really great contest for Valentine’s Day. We really are using things, even like Facebook and blogs and outreach programs that are very different for this brand, in order to attract a new customer in. And we will continue on the reactivation side. We are really prioritizing consumer facing spend. In terms of catalogue circulation, the one part of our circulation that wasn’t successful in 2008 was really the amount that we had invested in prospecting circulation. We got much better results with reactivation. So we have rationalized that for 2009. We have brought our circulation down in terms of not doing as much prospecting circulation. We will use these grass roots efforts to attract a brand new customer in and we will prioritize our spend with the house file and with the reactivation circulation. I'm looking for feedback. Based on what I've read on Twitter, the 2% of America that uses the micro-blogging service that will become the greatest marketing tool of all time until everybody switches to yet another platform in 2010 have strong opinions on these topics. What do you think? Issue #6: Name at least two catalog brands that dove head-first into physical retail stores, avoided crippling debt, and still managed to have a direct channel that grew at the same rate prior to diving head-first into retail stores? Issue #7: It is generally accepted as a best practice that the airline industry charges customers different amounts for identical seats on an airplane. Is it acceptable for a multi-channel brand to charge customers different amounts for the same sku on the same day, akin to what the airline industry does? Issue #8: If multichannel customers are the best customers, and all businesses have gone "multichannel" over the past several years, why aren't there more "best customers" to prop up the economy during these trying economic times? Issue #9: Is it truly necessary for a retail brand to have an outstanding "bricks and clicks" experience? The heading says "Expert: Giveaways Can Work Better Than Discounts". Of course, the spirit of the article isn't to instruct us to give everything away. But at some point, we have to stop the marketing hype that suggests we can solve all of our problems by giving the customer something for nothing. Multichannel Forensics work continually shows that customers move from full price to discounts to freebies ... they don't move the other direction nearly as fast. Google. There's a channel. The algorithm that is managed by algorithms! Does The Channel Scale? This depends upon who you are. I've yet to meet an online business that says that Google scales. In fact, every online business I speak with looks to "detether" from Google. You're less likely to detether from a channel that has unlimited sales potential. If you're tiny, like me, then yes, Google scales. But if you're everybody else? Does the channel do a good job of acquiring new customers? For a period of time in the middle of this decade, when we went from 2 billion searches a month to 32 billion searches a month, Google did a good job of helping us acquiring new customers. I fear our potential peaked in 2008. How do you break through now? Search for a sundress, and all the big and mid-sized players are there in paid search (JCP, Victoria's Secret, Target, Macys, Zappos, Nordstrom, American Eagle). Algorithm fanatics dominate natural search. There was a time, five years ago, when you could make some hay here. Now you're just part of the echo chamber. Does the channel aid in profitable customer retention? Have you seen a study that indicates that, without Google, customer retention drops by "x" points? I haven't seen such a study, either. Then consider that many of you tell me that half of your paid search customers are existing customers. Does that mean that Google is helping us? Is Google sending our customers to competitors (you bet they are). If Google isn't helping you retain customers, and half your paid search customers are existing customers, well, then, who the heck is benefiting from that relationship? Just something for you to think about the next time you hand over $0.40 for the phrase "sundress" so that Google will steer your own customer back to you. Does the channel aid in customer service? At best, a "maybe". Does the channel feed other channels? Google customers are loyal to Google, aren't they? They're more loyal to Google than to our e-mail or catalog marketing programs. And we consistently find that Google customers have lower lifetime value estimates than customers from other channels. Too often, Google is in isolation mode, yielding low value customers. Does Google generate profit? The secret to making Google a profitable channel seems to be two-pronged: Step 1 = Hire somebody to manage a bidding algorithm that outperforms other bidding algorithms. Step 2 = Hire somebody to game the natural search algorithm --- you're not selling to your customer when you work with Google, you're selling to an algorithm that reserves the right to change the rules of the algorithm without your consent. Do these two steps well, and Google generates profit for you. Does Google educate customers? Google does educate your customers. Google tells your customers what your competitors are doing. Customers have never been more educated! Google might be the best thing that ever happened to small businesses, but is frequently detrimental to the brand that uses offline advertising to drive a customer online for research purposes. What is the exit strategy for Google? What are the business scenarios that would cause you to not participate in paid search, and to not care about natural search results? Or what if you're a small business owner that hosts your blog on Google, runs your RSS feeds through Google/Feedburner, analyzes your visitors via Google, and obtains a third of your traffic through Google (oh oh, that's me)? Many online businesses seem to have an active strategy to grow the business independent of Google. What is your R&D strategy for Google? This means so much more than adjusting your keyword bidding algorithm. In our world, Google offers things like Google Checkout, and some of you have told me that Google offers some companies the opportunity to tie inventory systems into Google's systems in exchange for preferred search outcomes. That's exciting and terrifying all at the same time, huh? Does Google lend itself to in-house expertise or vendor expertise? More and more often this expertise is best managed via the vendor community. It seems to make sense to couple smart in-house knowledge with outstanding vendor-based knowledge. The Channel Advisor walks a fine line working with Google, almost playing the role of a "risk manager". The Channel Advisor recognizes that Google is important, while realizing that one cannot let Google control more than a small minority of the total sales volume --- the volatility makes inventory management very challenging. The Channel Advisor works overtime to find micro-channels within Google (i.e. keywords) or advertising micro-channels (catalog + Google, e-mail + Google) that deliver significant value. Of course, Google isn't my area of expertise, so your thoughts about how a Channel Advisor manages Google are welcomed. George speaks of a term we talk about all the time here in MineThatData Nation --- it is the essence of Multichannel Forensics, a term called "Multichannel Interaction". In the old days of direct marketing, we called it "cannibalization". Let's think about this in an old-school sense. You need to purchase a lawn mower this weekend. There are two Home Depot stores within driving distance, and one Lowes store within driving distance. You are brand-loyal to Home Depot. Home Depot closes one of the two stores that are within driving distance. Which store will you shop at? Home Depot? Lowes? Or will you simply not purchase your lawn mower? If customers are brand loyal, they will transfer their dollars from the Home Depot store that closed to the Home Depot store that is still open. If customers are not brand loyal, some will transfer their dollars from the Home Depot store that closed to the Lowes store that is still open. Both the remaining Home Depot store, and the Lowes store, will experience sales increases with the closure of the Home Depot store. This is the definition of cannibalization --- the store that closed was cannibalizing existing stores. We're seeing this dynamic, in real time, with the closure of Circuit City stores. This dynamic happens online all of the time --- and guess what? We seldom measure this dynamic! WHY? Hey Web Analytics professionals, why don't we spend more time focusing on what George calls "Multichannel Interaction"? My Multichannel Forensics work shows that when you remove one online micro-channel, you don't lose all of the sales that the micro-channel previously captured. For instance, if some imperial wizard were to shut down Google for one day, the sales that would normally happen via Google are not all lost. Some customers would shift their search activities to MSN or Yahoo!. Many customers would purchase without the aid of search. Some customers would not shop at all. Many clients ask me to illustrate what happens when one micro-channel is shut down (usually a dramatic slowdown in online marketing or the elimination of catalog marketing). The sales never disappear. A percentage flow out into the ether --- much of the sales (often between 30% and 70%) redistribute across the micro-channels most aligned with the channel being discontinued. For Web Analytics professionals, this is maybe the most fertile ground that exists. Cannibalization is happening on your own site --- when you introduce a new product line, do you believe that all of the sales in the new product line are incremental, or do you believe that customers transfer dollars from old merchandise lines to the new product line? These are wonderful times to be a Multichannel Forensics professional! I've heard from many of you who plan on attending my talk at ACCM 2009 in New Orleans. Now how about the rest of you?? My session is on Wednesday, May 6, from 11:15am - 12:15pm, and is titled "Multichannel Customer Behavior: Profit By Understanding The Role Of Geography". We'll do a deep dive into the magical world of Zip Code Forensics, the leading (and free) geographical segmentation tool for direct marketers. There's still time to register, and if you use this form, you can receive a 25% discount because you are a loyal member of MineThatData Nation. I'll be around on Wednesday (5/6) if you wish to get together to talk about your Multichannel Forensics project, or you wish to discuss an upcoming Multichannel Forensics project. And I might even bring along a couple of Multichannel Forensics books to share with loyal blog readers. So please attend my session!!! !